What a beautiful salad for a nice Spring meal. I bought what looked fresh and pretty on the day I made it. The balsamic vinaigrette recipe follows this one. It is easy to make and so good with this salad. 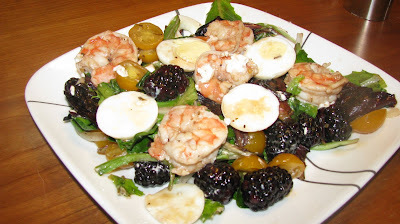 I used yellow cherry tomatoes and blackberries this meal. Boiling eggs that peel easy is tricky. Click on my link in the ingredients list to see MY tricks. This salad can be made with any lettuce, but the baby greens have a great flavor with the vinaigrette and berries. My balsamic vinaigrette recipe is attached through a link. Click on the balsamic vinaigrette link in the ingredients list.